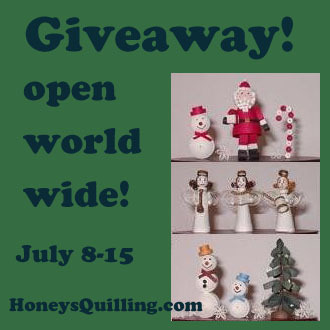 Welcome to the second July giveaways here at Honey’s Quilling! Make sure you subscribe to the blog and stay tuned on facebook so you know when each giveaway begins! This week you can enter to win this great 3D quilling kit featuring fun Christmas/winter figures. Snowmen, Santa, a Christmas tree and angels can all be made to adorn a special shelf for the holiday season. Included in this kit are instructions and paper strips. You will also need these other tools to complete the kit (these will not be included in the giveaway! ): quilling tool, white craft glue, sharp scissors, ruler, straight pins, tweezers, work board (corkboard, styrofoam, or corrugated cardboard). This giveaway is open worldwide! There are no special rules, just enter below in the rafflecopter widget and at the end of the giveaway a winner will be randomly chosen. I will then contact the winner and send them their prize, easy as that! Autumn Giveaways from Honey’s Quilling – Week 4 – Quilling Shapes Board! Very happy to enter this giveaway as 3D quilling is my favourite. Love your blog. Hi how do i subscribe to the blog? Is it enough if i like honeys quilling page on facebook? Hi Aparna.On the right hand sidebar underneath my intro it says “subscribe via email”. Just enter your email there and you’ll be subscribed to the blog 🙂 But for the entry for the giveaway it is to subscribe to the newsletter, not the blog, which is different. I meant to put both as entries, but forgot, I’ll do that next time! But to subscribe to the newsletter, the signup form is right here in the post (it wasn’t before, I just added it as I see it is not on my site yet, I forgot it, can’t believe it!) Sorry about the mixup! I just love all of your sites….and your give aways….and your tutorials…..and did I say I LOVE your artwork???? Thanks!!! Aw, thanks so much, you’ve made my day! I have not tried 3D quilling yet but I have been wanting too. Hi Honey ..! You just awesome ..!!! I love all of your creative ideas & would like to make them . You are such an inspiration to all the craft makers ..! !